Middle-class families have gotten some relief at the pump this spring due to declining gasoline prices. 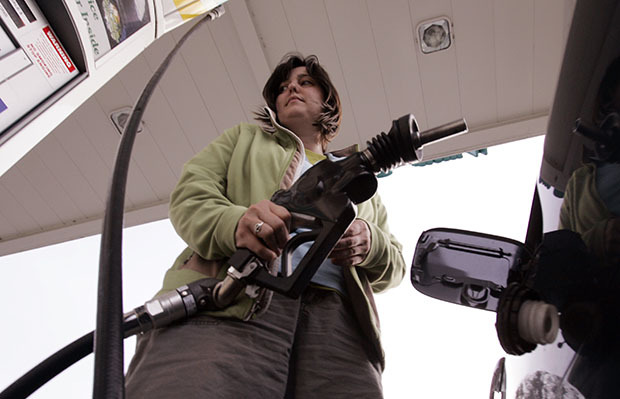 AAA reported that U.S. drivers paid an average of $3.55 per gallon of gasoline in April, the least expensive average for this month since 2010. Gasoline prices are now almost 35 cents lower than they were one year ago, when gasoline cost an average of $3.89 per gallon. Despite lower prices at the pump, the biggest publicly traded oil companies in the world have raked in billions of dollars in profit over the past three months. According to their earnings reports released today, the big five oil companies—BP, Chevron, ConocoPhillips, ExxonMobil, and Shell—earned a combined $30.2 billion during the first quarter of 2013, or $331 million per day. Cumulatively, Big Oil profits were 6 percent lower than the first quarter of 2012 due to lower gasoline and oil prices, but these companies still earned a combined $229,832 every minute from January through March. This is more than what 95 percent of American households earn in an entire year. Nearly one-third of these profits were used to repurchase companies’ stock, which only serves to pad the pockets of senior executives and the largest shareholders. The big five oil companies are also sitting on $82 billion in cash reserves, according to reports from the Securities and Exchange Commission for each company. While making these huge profits, BP and Exxon are the culprits in ongoing major oil disasters that are affecting the Gulf Coast and Arkansas. April 20, 2013, was the third anniversary of BP’s Deepwater Horizon disaster that killed 11 oil-rig workers and gushed 210 million gallons of crude oil into the Gulf of Mexico over the course of 87 days. Three years later hundreds of Gulf Coast residents are still experiencing serious health effects from this spilled oil, along with the nearly 2 million gallons of toxic chemicals dumped into the Gulf of Mexico to disperse oil during the haphazard cleanup process. There is growing evidence that the oil and dispersants are also harming sea life. Congress has yet to pass a single law to strengthen federal oversight of offshore oil and gas production. A year ago a Center for American Progress column, “The Lasting Impact of Deepwater Horizon,” highlighted the need for Congress to raise the preposterously low $75 million limit on liability that oil companies currently face for future oil blowouts. The cleanup costs for the 2010 BP disaster rang in at more than $14 billion at the end of 2012, according to the Congressional Research Service. This demonstrates the huge financial and environmental risks that face Americans if these liability limits remain so artificially low and the companies responsible for future disasters refuse to pay for cleaning up their messes. On land, meanwhile, fellow oil giant ExxonMobil’s most recent spill dumped 500,000 gallons of tar sands crude oil near Mayflower, Arkansas, in late March 2013. The spill forced the evacuation of two dozen homes, and a massive cleanup is currently underway. Because this tar sands oil from Alberta, Canada, is classified under the Superfund law as “diluted bitumen,” this and similar kinds of oil are exempt from the 8-cents-per-barrel fee that conventional oil must pay into the Oil Spill Liability Trust Fund. This fund, created under Superfund in 1980 and paid for by levying this tax on oil companies, pays for the oil-spill cleanup should a mishap occur. Exxon gets to avoid it. This terrible oil-pipeline spill spewed tar sands oil similar to the oil that could be transported through the Keystone XL pipeline if it is approved by President Barack Obama and Secretary of State John Kerry. Pipeline discharges are a common event. NPR reported that, “Federal data show that on average over the past decade, nearly 3.5 million gallons of oil spilled from pipelines each year.” If Keystone XL moves forward, not only will Big Oil profit from its operation, it could eventually add to this spill tally. The biggest three publicly owned U.S. oil companies—ExxonMobil, Chevron, and ConocoPhillips—also paid relatively low federal effective tax rates in 2011. Reuters reported that their tax payments were “a far cry from the 35 percent top corporate tax rate.” It estimated that ExxonMobil’s effective federal tax rate in 2011 was 13 percent, Chevron’s was 19 percent, and ConocoPhillips’s was 18 percent. The oil and gas industry gave more than $70 million in federal campaign contributions during the 2012 cycle, with a whopping 90 percent going to Republican candidates. The big five oil companies spent nearly $50 million on lobbying Congress in 2012, or more than one-third of the entire oil and gas industry’s expenditures. A major goal of these political activities is to retain special tax breaks for the oil and gas industry, which add up to $40 billion over a decade. Despite ranking as some of the most profitable companies in the world, the big five oil companies receive $2.4 billion in tax breaks from Congress each year, according to the Congressional Joint Committee on Taxation. U.S. taxpayers should no longer foot the bill for antiquated, 100-year-old fossil-fuel subsidies that, upon conception, were meant to help a then-fledgling industry grow. 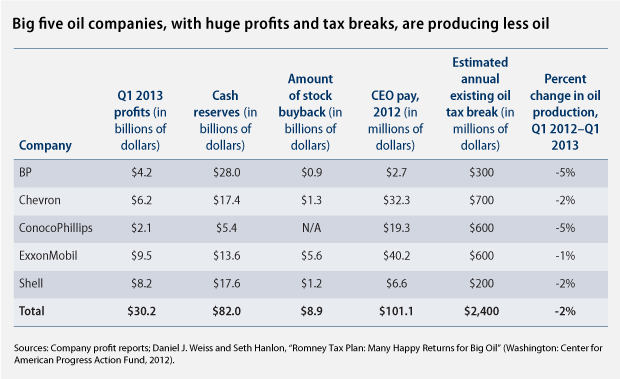 Big Oil argues that it needs these tax breaks for oil exploration and development. Yet the big five oil companies produced 2 percent less oil in the first quarter of 2013, according to their recent financial statements, compared to the same time last year. These companies each have several hundred idle offshore leases that could produce oil if they were to be developed, according to an analysis for Rep. Ed Markey (D-MA). Instead, these companies leave the leases undeveloped while sitting on billions of dollars of cash reserves. In addition to special tax breaks, Big Oil companies drill for oil and gas on public lands owned by all Americans while paying relatively little for what they produce from these areas. Oil companies pay a royalty for the oil and natural gas that they extract from these federal places: A law from the 1920s requires the oil and gas industry to pay “not less than” a 12.5 percent royalty on oil and gas produced from onshore public lands. This rate has not been permanently increased in nearly 100 years, despite the fact that there is nothing preventing Congress or the Obama administration from doing so. The federal royalty for oil and gas production on public lands is much lower than what is paid to some states and private landowners for oil taken from their lands. The state of Texas, for example, assesses up to a 25 percent royalty for oil produced from its lands. North Dakota has a royalty of 18.8 percent, while Wyoming’s rate is at least 16.6 percent. Royalties for oil taken from private landowners nationwide are estimated to average 18.8 percent. Higher royalty rates on federal public lands would ensure that Americans receive more compensation for oil companies’ use of their lands and minerals, which is all the more important in this time of fiscal uncertainty. The Department of the Interior should finalize plans to significantly raise the royalty rate for oil and gas produced on public lands. The five biggest oil companies are making tens of billions of dollars in profits, while paying artificially low effective federal tax rates and low royalties for taking and producing oil and gas owned by all Americans. In addition, companies can evade payments into the oil-spill cleanup fund based on specific categorizations of different kinds of petroleum. Meanwhile, the five largest public oil companies continue to make billions of dollars in profits every quarter while receiving special tax breaks from Congress. None of this makes sense, especially when sequestration is forcing steep automatic across-the-board cuts in college assistance, cancer research, and other middle-class programs. It’s time to ask the huge profit-making big five oil companies to pay their fair share. Daniel J. Weiss is a Senior Fellow and the Director of Climate Strategy at the Center for American Progress. Jackie Weidman is a Special Assistant to the Energy team at the Center. Thanks to Jessica Goad, Manager of Research and Outreach for the Public Lands Program at the Center for American Progress.